Kagrenac was known as a meticulous and careful planner. He has been attributed with many titles over the years, among them "High Priest", "Magecrafter", and "High Engineer". Master Crafter Yagrum Bagarn, the last living Dwemer, worked as one of Kagrenac's Tonal Architects and knew him personally, and he used "High Craftlord" as Kagrenac's proper title. Vivec was inconsistent, calling him "High Engineer" and "Kagrenac the Blighter", though he also corroborated "High Craftlord", as well. Kagrenac had numerous underlings; sources indicate Dahrk Mezalf and Bthuand Mzahnch (author of The Egg of Time) were just two other prominent smiths who worked under him. Among their many amazing creations was Moon-and-Star, a specially enchanted ring that could only be worn by Nerevar, thus serving as an absolute proof of identity. His theories on how to make a new god using the Heart of Lorkhan were explained in Divine Metaphysics, though the text remained indecipherable to anyone lacking a detailed knowledge of Dwemeris. Yagrum Bagarn, though he didn't work on the Anumidium project, was able to understand Kagrenac's theories, but refused to explain them, as he believed Kagrenac's theories should die along with him. As his alternate title "High Priest" suggests, Kagrenac was, for all intents and purposes, a religious leader in the little-understood Dwemer traditions. The precepts of Kagrenac were taught at the Dwemer settlement Kherakah, where it is said the most learned people in the world made their home. They spent their days studying Kagrenac's words and giving consideration to their place in the life to come. In Kherakah, nothing was more valued than the understanding of the self and its relationship to the Heart. Kagrenac's library was found in a settlement known as Tureynulal. However, the Dwemer were not unified in their thinking about Kagrenac's theories. While Kagrenac and some of his architects emphasized the benefits, others believed that an attempt to apply his theories posed risks which were unjustifiable, noting the unpredictable side effects of his formulae and the potential for catastrophic error. The Cyrodiil historian Borgusilus Malier first theorized that in 1E 668, the powerful Dwemeri philosopher-sorcerer "Kagrnak" used the silent and magical ability of the Dwemer known as "the Calling" to gather his people together for a great, sublime journey, resulting in their disappearance. At least one legend asserts that Kagrenac began acting on his theories in secret, implying that his subterfuge led directly to the War of the First Council. King Dumac, knowing nothing about his High Craftlord's project, denied its existence to his friend Nerevar, then took great offense when Nerevar returned later to demand their designs for the Heart of Lorkhan cease. The same legend says the High Craftlord was killed by Dagoth Ur during the Battle of Red Mountain, and it was Nerevar, with the aid of Azura, who turned the Dwemer to dust. Vivec remained silent on whether Dumac knew of Kagrenac's project, but he does note that Kagrenac took great offense to Nerevar's assertions when the Hortator first questioned Dumac about it. He also notes that it was Dagoth Ur who, through unknown means, first discovered Kagrenac's plans for the Heart of Lorkhan and informed the Chimer leadership. Most accounts of the Battle of Red Mountain do not say that Dagoth Ur killed Kagrenac, but rather, that Kagrenac used his tools on the Heart at the climax of the battle, coinciding with the moment that all Dwemer then on Nirn disappeared. In Dagoth Ur's Plans, it is noted that Dagoth Ur, who used a ritual of his own devising to bind himself to the Heart of Lorkhan, had apparently adopted the views and motivations of Kagrenac. 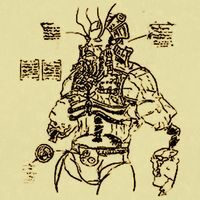 36 Lessons of Vivec, Sermon 36, contrary to every other source (even other works by Vivec), asserts that Kagrenac actually got his "walking star" Anumidium working at the Battle of Red Mountain. The great destruction it wrought created the Inner Sea, and it was only through the intervention of the Tribunal that it was defeated and the Dwemer were removed from the world. ^ a b c d e f g h Yagrum Bagarn's dialogue in Morrowind. Esta página foi modificada pela última vez à(s) 04h02min de 17 de outubro de 2015.